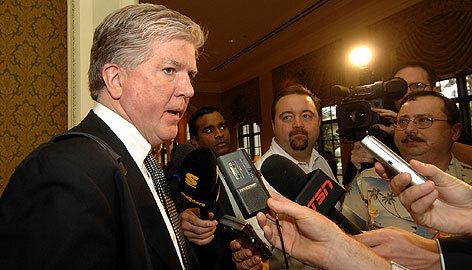 It appears that Brian Burke has signed a 6-year, $18 million deal to be President and General Manager of the Toronto Maple Leafs, something that I am very happy about. It's about time that we had a full-time, permanent GM who actually knows something about hockey (Yes, I am talking to you JFJ and Richard Peddie) and I have firmly believed that Burke was the right man for the job for a long time. I think that the union of head coach Ron Wilson and Burke will be a very smooth one, as they were college roommates at Providence, and will lead to a very fruitful relationship as they try to right the Good Ship Maple Leaf and make the team a contender again. I couldn't have chosen two better men for the job if I myself was in charge rather than those tools at Maple Leafs Sports & Entertainment. A word of warning to Mr. Burke: this is a whole different kettle of fish than what you were given when you took over the reins in Anaheim--we don't have a Perry or a Getzlaf, so be wise, draft well, and remember your very own words: "people need to evaluate with a calendar, not a stopwatch." Posted by The Renegade Librarian at 1:40 p.m. I hoped that the hairdo wouldn't have gotten his way and landed in Toronto. He may be good at what he does, but I think that he is just way too cocky to think that he deserves whatever he wants. We shall see Bing, I wonder if he can do what he did with the ducks. All i know is that he has a long road ahead. And that T.O.fans will want to see big things happen sooner then later.